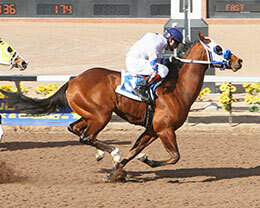 SUNLAND PARK, NM�MARCH 20, 2015�Denis and Julie Schoenhofer's Nucky scored an impressive three-quarter length victory in his career debut on Friday�pulling three additional qualifiers into the finals of the Grade 2 West Texas Futurity at Sunland Park Racetrack & Casino. The ten fastest qualifiers, from the 63 two-year-olds who participated in seven trials Friday afternoon, will return to Sunland Park on Sunday, April 12 and vie for the winner's share of $199,450 purse going 300 yards. Jockey Salvador Martinez rallied Nucky to a :15.210 clocking in the sixth trial to post the top qualifying mark. It was the first career start for the Justin Joiner trainee who entered the race off two works over the Sunland surface earlier this year. Nucky is from the first crop by Ruidoso Grade 1 placed DOMINYUN. Bred in Texas by Bobby D. Cox, he is out of the Southern Cartel mare Southern Brook, a half-sister to stakes winner Dianetobewitcha ($180,272) and grade 3 winner and multiple stakes producer Dianetogetcha ($63,373), the dam of RG3 winner and first crop sire Freighttrain B ($421,761). Dig This Jaems, an IVORY JAMES colt, owned by Joe Rios and Jason Rios finished second by a neck in the fith trial to post the fifth fastest time of :15.464 seconds. Eliseo Loza Gonzalez conditions with Jaime Leos getting the ridding call. Vicki Banks bred Dig This James in Oklahoma from the Digging For Gold mare Diggin On High. For the complete list of West Texas Futurity(G2) finalists, times, sires, dams, owners, breeders, trainers and jockeys CLICK HERE. IVORY JAMES and DOMINYUN each sired a qualifier to the $50,000-Guaranteed West Texas Juvenile Invitational to be run on Saturday, April 11th. The 11th through 20th fastest qualifiers from today's trials are preferred invites to the race. Flare For Ivory, an IVORY JAMES colt out of Special Phoebe, by Special Effort, posted the sixth fastest Juvenile time for owners Hugo Barron Sierra and Margarita Barron. Hugo trains the Oklahoma-bred colt. Vaughn and Jill Cook is the breeder. Miss Feet Down First got the final Juvenile qualifying spot for owner Esequiel Porras. Elbert Munoz saddled the DOMINYUN filly out of Feet Down First, by First Down Dash. Isbell Charolais is the breeder. For the Juvenile list CLICK HERE.